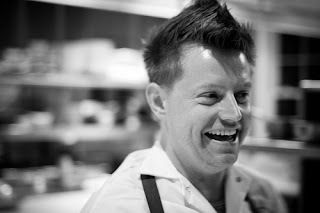 Richard Blais might be one of my favorite celebrity chefs. He also may be singlehandly responsible for my interest in adventurous eating...He's most well known for his focus on molecular gastronomy. I will fully admit that this is a ridiculously expensive experience. But it will be the most memorable meal you've ever had. I had a course based on a burning cigar that not only looked like a burning cigar, was served in an ashtray, and managed to conjure up the idea of a smokey cigar in an absolutely delicious way..Plus, how can you not like a couple of chefs that team up with TED? Oh man, I was such a fan of Future Foods when I could catch it...it's not been on OnDemand in a while, though. But JEALOUS of your eating at Moto. And Richard Blais is awesome. I'm kind of rooting for him in Top Chef All Stars. When I'm not rooting for Carla, that is. Moto is seriously AMAZING! You're a Carla fan? Carla has grown on me but she's still pretty low on my list...I'm going for Richard for sure! In fact, he and Dale are the only ones I really enjoy that are left!